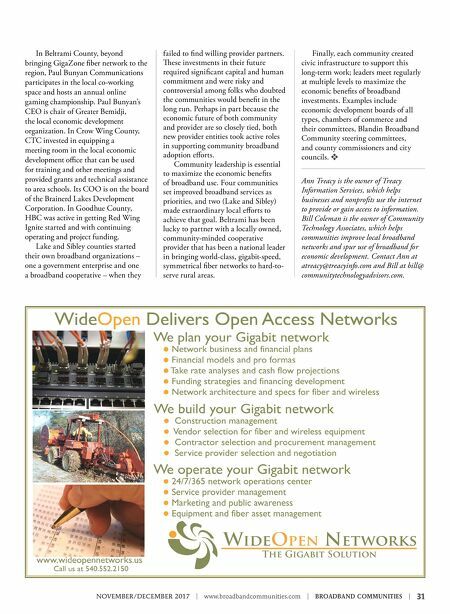 NOVEMBER/DECEMBER 2017 | www.broadbandcommunities.com | BROADBAND COMMUNITIES | 31 In Beltrami County, beyond bringing GigaZone fiber network to the region, Paul Bunyan Communications participates in the local co-working space and hosts an annual online gaming championship. Paul Bunyan's CEO is chair of Greater Bemidji, the local economic development organization. In Crow Wing County, CTC invested in equipping a meeting room in the local economic development office that can be used for training and other meetings and provided grants and technical assistance to area schools. Its COO is on the board of the Brainerd Lakes Development Corporation. In Goodhue County, HBC was active in getting Red Wing Ignite started and with continuing operating and project funding. Lake and Sibley counties started their own broadband organizations – one a government enterprise and one a broadband cooperative – when they failed to find willing provider partners. ese investments in their future required significant capital and human commitment and were risky and controversial among folks who doubted the communities would benefit in the long run. 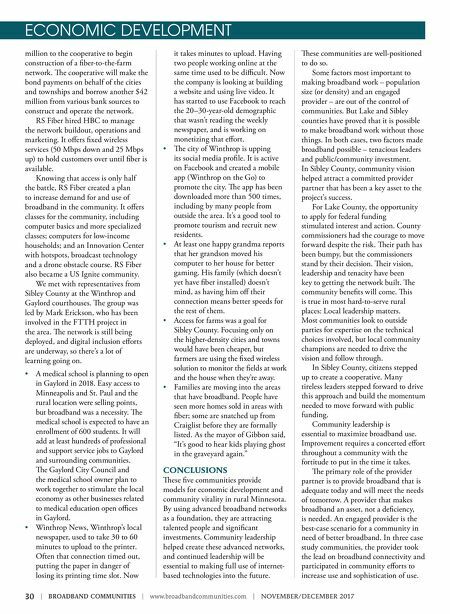 Perhaps in part because the economic future of both community and provider are so closely tied, both new provider entities took active roles in supporting community broadband adoption efforts. Community leadership is essential to maximize the economic benefits of broadband use. Four communities set improved broadband services as priorities, and two (Lake and Sibley) made extraordinary local efforts to achieve that goal. Beltrami has been lucky to partner with a locally owned, community-minded cooperative provider that has been a national leader in bringing world-class, gigabit-speed, symmetrical fiber networks to hard-to- serve rural areas. Finally, each community created civic infrastructure to support this long-term work; leaders meet regularly at multiple levels to maximize the economic benefits of broadband investments. Examples include economic development boards of all types, chambers of commerce and their committees, Blandin Broadband Community steering committees, and county commissioners and city councils. v Ann Treacy is the owner of Treacy Information Services, which helps businesses and nonprofits use the internet to provide or gain access to information. Bill Coleman is the owner of Community Technology Associates, which helps communities improve local broadband networks and spur use of broadband for economic development. Contact Ann at atreacy@treacyinfo.com and Bill at bill@ communitytechnologyadvisors.com.